Children’s singer and songwriter Raffi may have brought beluga whales into popular culture with his 1980 song “Baby Beluga,” but surprisingly little is actually known about the life and ecology of these elusive marine mammals that live in some of the world’s most remote, frigid waters. Two distinct populations spend winters in the Bering Sea, then move north as sea ice melts and open water allows them passage into the Beaufort and Chukchi seas. There they feast on Arctic cod, frequently diving to depths of 200 to 300 meters — and sometimes over 900 meters (0.5 miles) — to find food. As the Arctic continues to change due to rising temperatures, melting sea ice and human interest in developing oil and shipping routes, it’s important to understand belugas’ baseline behavior, argue the authors of a new paper published this winter in the journal Marine Ecology Progress Series. 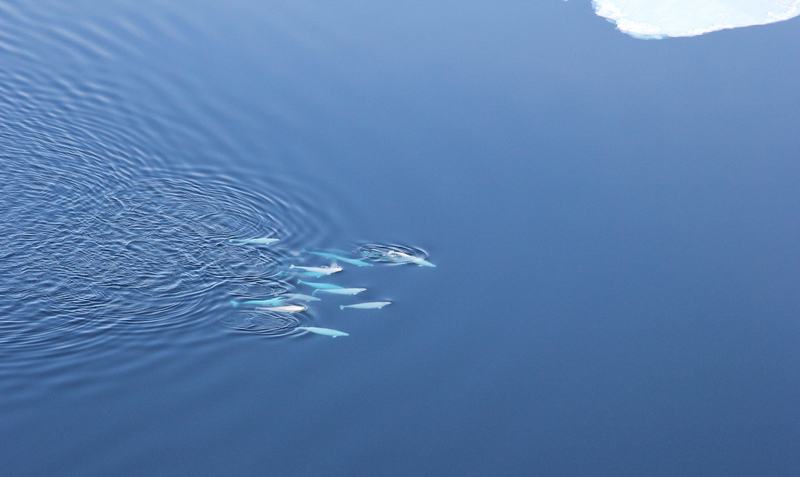 Its authors drew upon a rare dataset that spans 15 years of dive information for 30 whales to produce a comprehensive analysis of beluga migration and feeding patterns in the Arctic. Beginning in 1993, researchers worked with Alaska Native communities in Northwest Alaska and Aboriginal tribes in Canada to tag beluga whales. The whales often swim close to shore during early summer, making it possible to capture a whale and attach a satellite-linked tag to the dorsal ridge along its back. 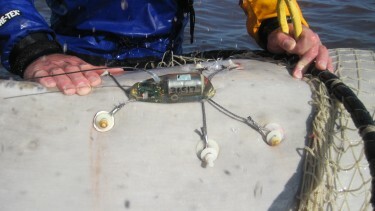 The tags are designed to turn on when the whale surfaces to breathe, then transmit locations and dive depth to a satellite that then relays data back to researchers electronically. Tag technology has improved over time, with one tag remaining on a whale and transmitting data for 18 months. For this study, the researchers also looked at the distribution of Arctic cod, a primary food source for both beluga populations, and compared that data to the locations and depths where the whales dove. They found the whales most frequently dove to depths where Arctic cod congregate (200-300 meters or 650-1,000 feet), confirming these fish are a significant source of food for belugas, and that the whales will dive to depths that maximize their encounters with prey. The data evidenced this second finding by recording diving behavior that was all over the map, literally. Both beluga populations frequently dove to the bottom of the sea to feed on bottom-dwelling organisms in the northern Bering Sea and Chukchi Sea, but then dove in more mid-depth ranges along areas that sloped from shallow to deep. They were likely looking for opportunities to eat based on where prey was concentrated by oceanographic features, Hauser said. Ultimately, this study helps illuminate aspects of a yearly migration that spans thousands of kilometers in a region that’s experiencing rapid change. 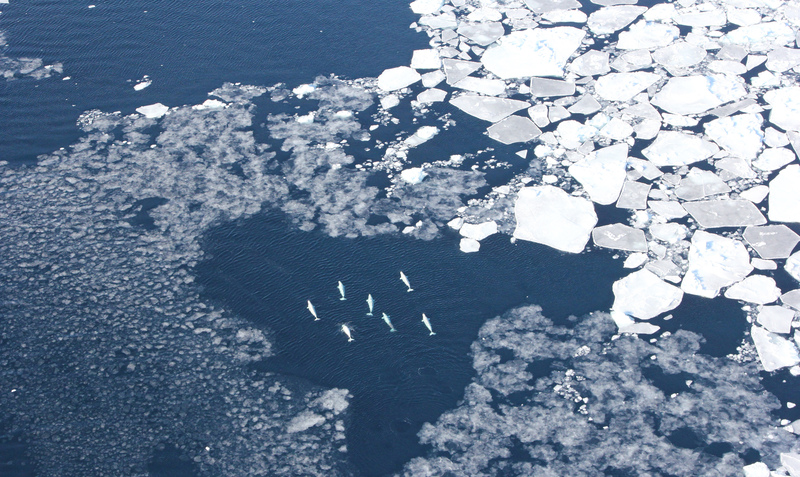 The researchers will look next at how the timing of beluga fall migration south may be affected by later sea ice freeze-up in the northern Arctic under climate change. Other co-authors are Sandra Parker-Stetter of UW aquatic and fishery sciences and the Northwest Fisheries Science Center; John Horne of UW aquatic and fishery sciences; Robert Suydam of Alaska’s North Slope Borough Department of Wildlife Management; and Pierre Richard of Fisheries and Oceans Canada’s Freshwater Institute. Beluga tagging was funded and supported by a number of organizations, including the Alaska Beluga Whale Committee, village of Point Lay, North Slope Borough and National Marine Fisheries Service (see the paper for a full list). Funding for Hauser’s analysis came from the National Science Foundation through UW’s Integrative Graduate Education and Research Traineeship (IGERT) Program on Ocean Change. For more information, contact Hauser at dhauser@uw.edu.